• Demolition - Pulling the parts off of the donor car. • New parts - The new and unique parts required for this project. • Battery system - The original sealed lead acid battery system. • Getting the lead out! - In 2011 the lead batteries were replaced with lithium batteries. • Motor - The motor, controller and adaptor plate. • Vacuum pump - Needed for the power brakes. • Heater - Installing an electric heater core. • A Public Showing - The first public showing, Earth Day 2010. Using the online Battery List & Pack Calculator. • Top-Balancing the Lithium Pack (12 min.) - Using an old MIG welder to top-balance the lithium battery pack. • Crusin' on Kilowatts (2 min.) 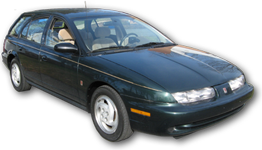 - My electric Saturn featured on the local ABC news affiliate in central Pennsylvania. • Overview (10 min.) - A quick overview covering the highlights of the Saturn EV conversion from beginning to end. • Spinning the Wheels (5 min.) - Demonstration of the electric motor spinning the wheels and regenerative braking. Information for anyone interested in doing an EV conversion of thier own.